Since we can enjoy our loft now, I decided to add a Christmas tree up there this year– a glam Christmas tree to be exact. And I’ve teamed up with some amazing bloggers for the King Of Christmas Tree Celebration Tour. If you’re coming over from Happy Happy Nester, welcome! King of Christmas graciously partnered with me on this gorgeous 7.5 foot lit King Flock tree. The flocking is evenly distributed on all of the the tree, and the flocking didn’t shed very much when assembling the fluffing the tree. Putting together the tree was a breeze with their Power Pole system. You just click the three pieces together and the lights are ready– no searching for and plugging in wires inside the tree. When it came to decorating the tree, I decided to go with a glam theme based on the tree collar I wanted to use. While it was a bit of a splurge, I got it on clearance at the end of last season. Plus, I figure it’ll last for years. 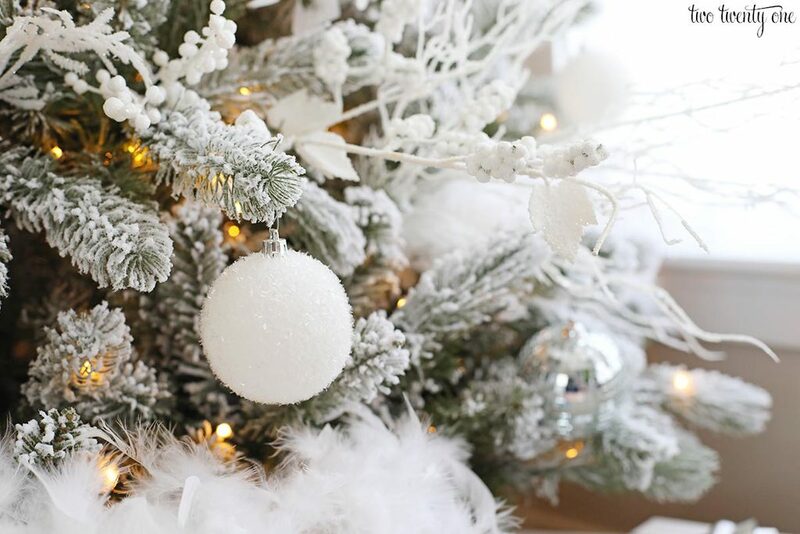 I used a lot tree decorations from my all white Christmas tree. But I worked in some new stuff, like the white feather boas to create the appearance of heavier snow. I had one white boa on hand and I bought four more using 40% and 50% off coupons at craft stores. I cut the boas into smaller sections so I could spread them out on the tree. Some of the ornaments are new too. 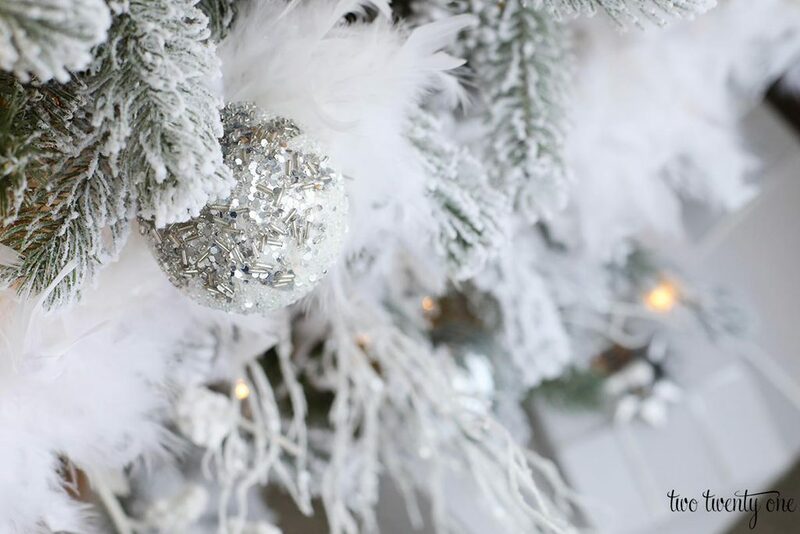 I couldn’t resist these disco ball and white and silver ornaments I spotted last weekend. This tree was probably one of the easiest trees I’ve ever put together. I typically don’t enjoy decorating the tree because something always looks off to me and I have to keep walking away and coming back but that didn’t happen with this one for some reason. One thing I’ve learned from decorating trees, is to not focus much on ornaments. I really enjoy using picks. In fact, I didn’t use any ornaments on my Christmas tree last year— just two types of picks. Just make sure you get out there and grab your picks soon. I’ve found that a lot of stores don’t restock them once they’re gone. So the tree didn’t look lonely, I put ribbon on some white boxes. But now Owen is asking when he can open his presents upstairs. It’s going to be a long month and half until Christmas. 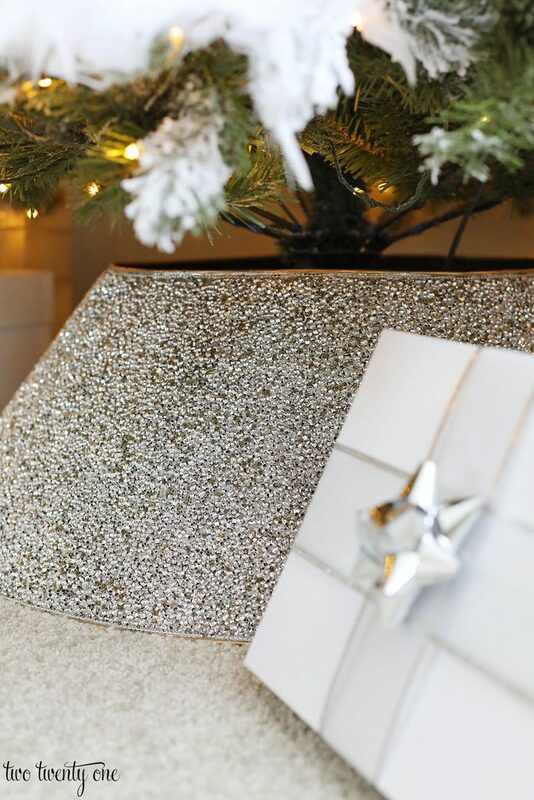 I’ve teamed up with some amazing bloggers for the King of Christmas Tree Celebration, which was coordinated by the lovely Janet from Shabbyfufu. And if you’re following the tour, Jenna Kate At Home is next! 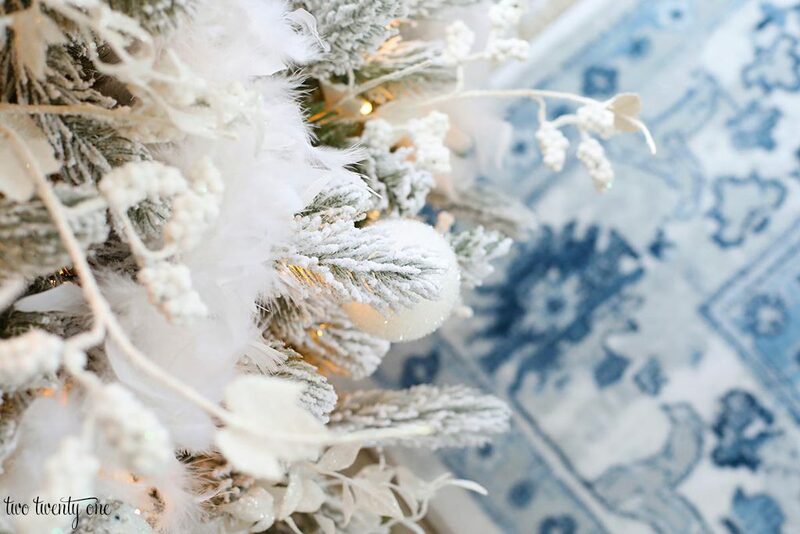 Definitely check out all the trees for some Christmas decorating inspiration. 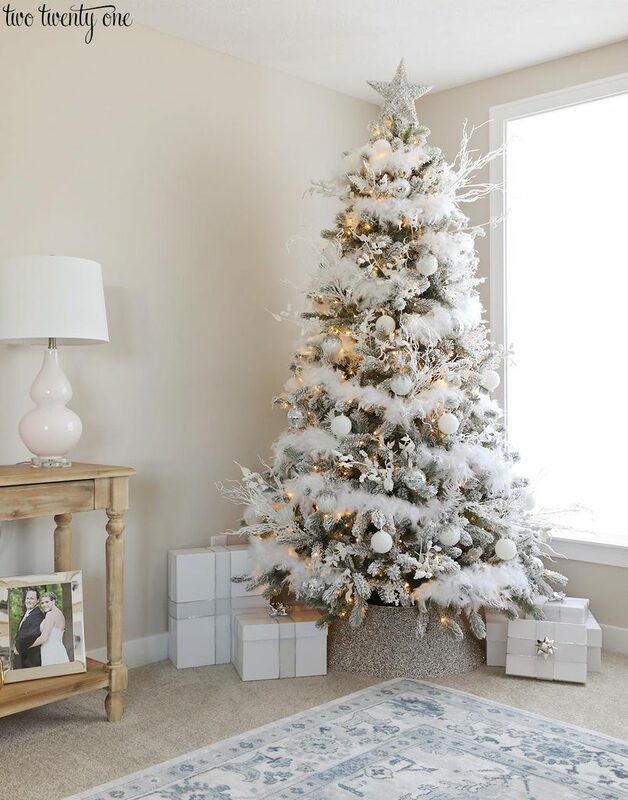 Love this glam look Chelsea and the tree looks amazing! One of these days I think that I need a tree collar. Happy holidays! 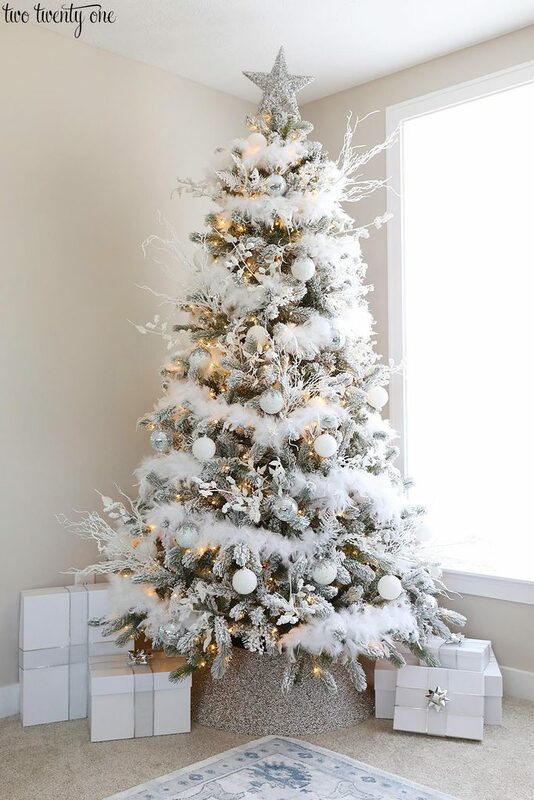 Absolutely love your tree it is gorgeous thanks for sharing. I almost bought that tree collar last year and now I’m so sad I didn’t! Love it! That tree collar is amazing! I love it! That tree collar is gorgeous! You are so talented! 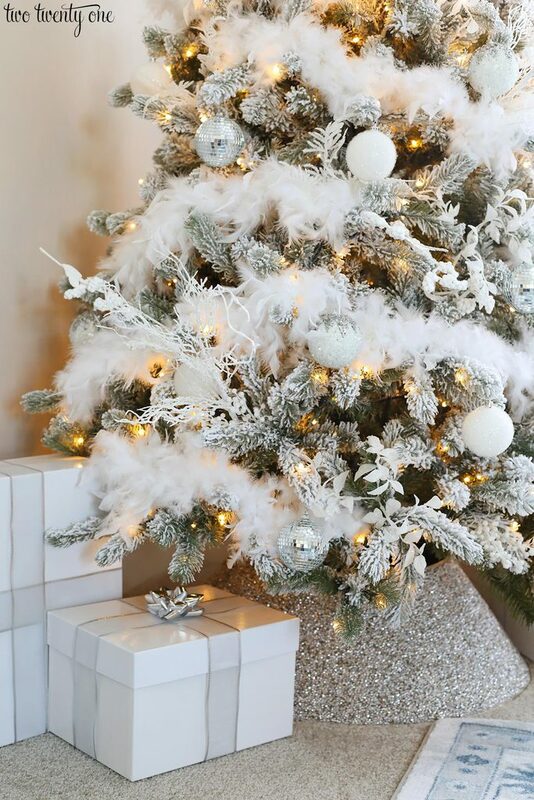 Your tree is definitely glamorous and gorgeous! 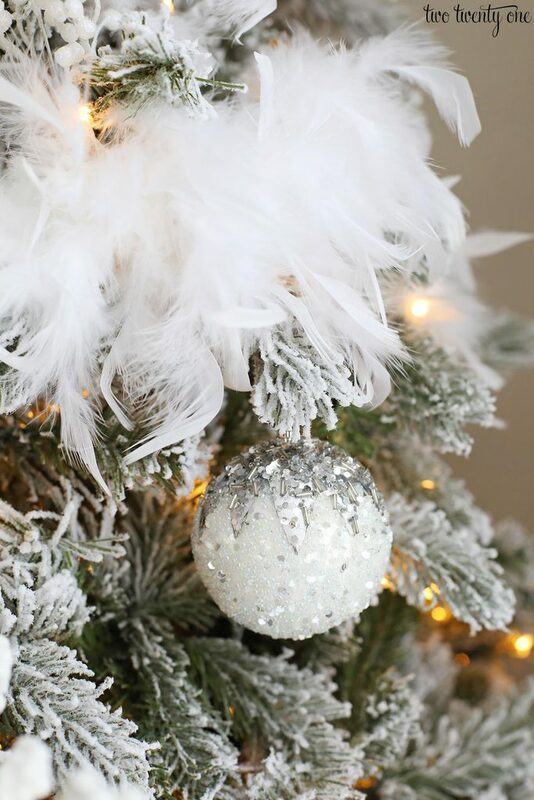 I place the white feather boas on our tree as well. Love your tree collar that sparkles so nicely. What a beautiful tree! Beautiful! Love that tree collar. This is gorgeous, Chelsea. 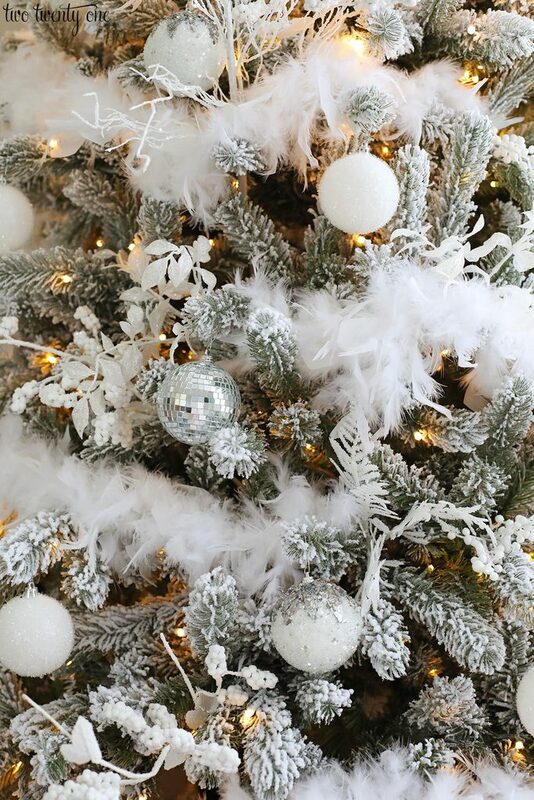 I love the feather boa in the tree with all the white. It’s perfection!